Nature shows the beauty of plants far better than we gardeners could ever hope to. No garden can hold us in awe like the ethereal haze of a bluebell wood in Britain in the spring does, or overwhelm us as much as the short flowering of Technicolor hillsides in South Africa’s Namaqualand. These brief moments of seeing plants in their native habitats doesn’t just instruct us in how to grow them in our gardens: it shows how the majesty of plants can move us. One such moment happened to me in a deep gorge in the French Pyrenees. On a crisp, clear, February day as the snow was melting, the sun shining through the just-emerging beech leaves revealed that the rocks and plateau ahead had turned blue. Not the misty blue of bluebell woods but a dense carpet of deep, solid cobalt. 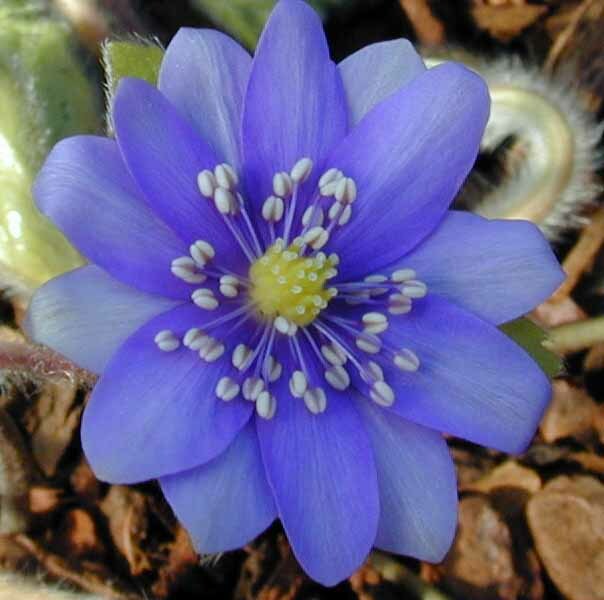 The cause of this breathtaking sight were hundreds upon hundreds of a demure, modest perennial: Hepatica nobilis. A member of the buttercup family, Ranunculacae, Hepatica nobilis is prevalent throughout continental Europe from the south of Spain to the north of Sweden and Norway and across to Romania; from deciduous woodlands at sea level to high-altitude coniferous forests. Depending on local climatic conditions, flowering is between January and March. The individual flowers are about 1cm in diameter and the plant grows to no more than 10cm tall. The flowers are a botanical oddity in that they are apetalous – flowers without petals. It’s the plant’s sepals that make up the daisy-like flower. The rounded leathery leaves are very variable in colour, with some being delicately marbled or veined with silver. The plant gives the appearance of being evergreen but in fact the leaves that are present during flowering are the remains of the previous year’s foliage. New leaves unfurl, fresh apple-green and vigorous, after the plant has finished flowering. In the Pyrenees the flowers are generally shades of deep blue with white pistils but occasionally there are pink flowers and, rarely, white. In eastern Europe pink flowers dominate. It is in this eastern part of Hepatica nobilis’s range, the Carpathian Mountains, that a more vigorous species occurs. H. transsilvanica has larger leaves and flowers than H. nobilis and grows to about 15cm tall. and spreads quickly by tough rhizomes. Again the flowers are predominately blue with the occasional pink or white flower. In this area the two species have crossed to form H. x media, a strong, large-flowered hybrid. The many cultivars of H. x media and H transsilvanica are the best plants to use in British gardens if you want to mimic the drifts of Hepatica seen in the wild. H x media ‘Harvington Beauty’ has large dark blue flowers while those of H. transsilvanica ‘De Buis’ are smaller but more abundant. Both are energetic colonisers. 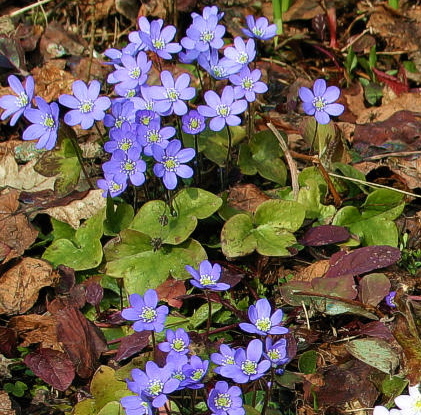 Hepaticas are also found in North America, from the mid-west through to Newfoundland. The prevalence and popularity of the plant has been described by the late nineteenth century American naturalist and poet Dora Read Goodale. Her description of ‘the silent token of an April day’ may not be as evocative as Wordsworth’s ‘Daffodils’ but she does convey the quiet appeal of Hepaticas. The plant she was writing about is H. acutiloba, the common Liverleaf, whose sharply lobed leaves resemble the ace of spades. A much taller plant than the European species (up to 25cm tall) it has a similar range of flower colour, from white and pale pink through lavender and pale blue. Occasionally the flowers are lightly perfumed. The other species found in North America, H. americana has more rounded foliage and a more compact habit than H acutiloba. It is very similar to the European species. The flowers of the European and North American species have a simple beauty, but their cousins from the other side of the world in Japan are much more complex. It is they that have been responsible during the last thirty for an upsurge of interest in the genus. 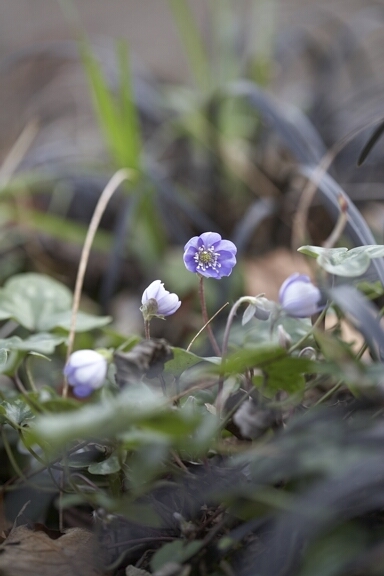 Hepatica japonica is known colloquially in its native Japan as ‘Flower Breaking Through Snow’ and occurs in three distinct forms. H. japonica f. magna is the most variable, having flowers ranging from pure whites, through pink and reds to purples, violets and blues. Additionally, they are found with single, semi-double and double flower shapes. Anecdotal evidence suggests that such wide variations did not exist 50 years ago. Many Japanese people belief that the mutations are the result of radiation that fell on the country after the dropping of two atomic bombs during the Second World War. Whatever the truth of this, few other plant species show such a wide variation in the wild. Inevitably these wild plants have been used by collectors and breeders as a source of hybridisation. The hybridising and cultivation of Hepaticas is a relatively recent phenomena in Japan, starting in the late 1970’s, but already there are over 600 named varieties. Each part of the flower has been developed to enhance its beauty: stamens, carpels and sepals are flattened, twisted and mutated in every conceivable manner. A lexicon has been built up to describe the shape and colour of the flowers. Ring around the Sun describes flowers whose swollen stamens form a circle in the middle of the flower; Many-petalled refers to flowers with more that ten petals; Thousand Layered are the pom-pom shapes of 1950’s bathing hats. These are flowers that Fabergé could have created, superbly crafted with bright enamels and rare gems. Growing Japanese Hepaticas in Britain is not easy, because although they will withstand extreme cold they will not tolerated our winter wet. Even the most experienced gardeners struggle to grow them well outdoors. The Dowager Marchioness of Salisbury has planted a Hepatica bank at Hatfield House and while the European and North American species are taking hold the Japanese ones are not thriving. In 2002 the RHS gardens at Wisley planted several hundred Hepatica japonica f. magna in the rock garden. Those that survived thieves (about 50% of the hepaticas were stolen) did not flourish and are being replanted in a drier, shadier area. It seems that the best way to grow them in Britain is in a cold greenhouse, with plenty of shading, using a very well-drained compost. 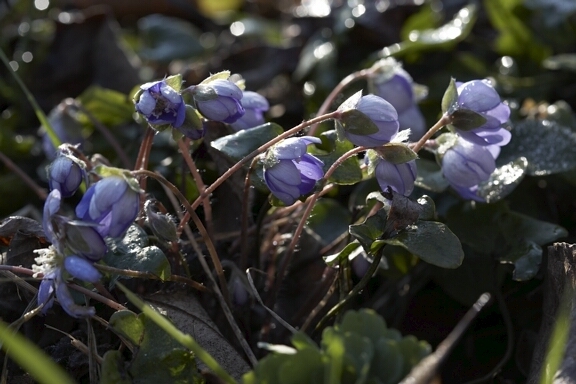 In Japan, Hepatica societies have sprung up throughout the country and each spring enthusiasts show off their treasures. The plants are exhibited in wide, low clay pots, usually in front of a bamboo screen. To ensure maximum drainage the pots have large holes and small feet that hold them off the ground. In the way that Auriculas are displayed in Britain, the Hepaticas are shown as if they are works of art, isolated from their natural surroundings. Their popularity amongst Japanese collectors has led to an over-inflated market for the plants. Like 17th century tulips or Edwardian orchids, enthusiasts are prepared to pay huge amounts of money for a single plant. Here in Britain, imported Japanese Hepatica range in price from £30 to £500. One reason, perhaps that Hepatica collecting has not caught on. If William Blake could see Heaven in a Wild Flower, then in these cultivated hybrids one can appreciate the magnificence of Nature. One Japanese collector described gazing at these minutely detailed flowers, their delicacy and colourfulness, as a form of meditation. The Hepatica is another example of how both seeing swathes of plants in the wild or closely studying the intricacies of a single flower can inspire our gardening. From hepar, the Greek for liver, the plant was often used by European herabilists as a treatment for liver diseases and indigestion. Because freckles were seen as an indication of liver problems it was thought that these, and other skin blemishes, could be eradicated by drinking boiled Hepatica leaves. Native Americans used the plant to treat bronchial problems and as a diuretic. By the middle of the nineteenth century its efficacy as a medicine was being called into question in Europe. At the same time in North America several patent medicines, many concocted by travelling doctors, contained Hepatica leaves. It was probably their ineffectiveness as a cure for liver and kidney problems that led to the plant’s decline. Today the plant is little used by herbalists, although it is still an active ingredient in at least one herbal diuretic. In the garden the European and North American species require a very shady position in well-drained soil. They grow well in alpine gardens and even scree beds as long as they are shaded during the summer. Mine are planted in a raised bed in the shade of tall conifers. The compost in the bed is roughly equal parts of leaf-mould, loam and grit. Trevor Wilshire from the Rock Department at the RHS garden at Wisley advises planting out pot-grown hepaticas in the early Spring, just as the new growth is starting. At the Hepatica specialist Ashwood Nurseries, Japanese varieties are grown in pots kept in heavily-shaded tunnels. A grower at the nursery, Phillip Baulk, recommends a compost of equal part John Innes No2, leaf-mould and Perlite. His plants are well watered during the spring and less so during the rest of the year, although they are never allowed to dry out completely. Seed is produced very soon after flowering and should be collected while it is green. Sow it immediately and be patient. Germination is very erratic and can take up to a year. You will need to wait up to another two years before your plant flowers.